Lately, I have been in cooking limbo, if you will. One of my biggest fears of going to culinary school and pursuing a career in food was that I would eventually grow tired of it and never want to cook at home. There is definitely a side of me that can relate to this. After working with food all day every day, there are times, especially during the weekend, that I would rather not even think about food. It’s weird. I don’t think it’s because I am growing tired of the “cooking” part itself… I think it’s boredom with the process. It’s the repetition of it all - the planning, the prepping, the cooking, the serving, the cleaning up, rinse, and repeat. Even though the meals I make change daily and only repeat a few times a term, all the preparations are strangely familiar to one another – the final product just wears a different costume. So, how do you get out of a cooking rut? This is a difficult question to answer, because I’m not sure I’m fully out of it yet. I can say what has helped me. 1. Cook for family and friends. Who else better to cook for than those whom you love and love you in return? No, I’m not talking about the people you live with. Craig and I are spoiled in the way that I bring dinner home from work every day. It’s such a perk, but such an oddity because I rarely cook at home anymore. Maybe if I didn’t do this for a living, cooking at home would be more of an event and something to look forward to. For me, cooking for extended family and friends is a great way to take yourself out of “autopilot” and really refresh your creativity. This past December, we traveled to New York to spend a week with Craig’s older brother and sister-in-law, and their new twin baby boys. We went with the intention of meeting our new nephews and helping out any way we could. Turns out, caring for twins is really hard…and time consuming. Even with four grown adults present, there were times when an extra hand would have been helpful. We tried to lighten the load a little by cooking dinner most of the nights we were there. I realized how bored I was with my usual meals when I went to plan out the menu for the week. I really had to dig deep and look back to my previous cooking experiences to find something I could really get excited about serving. This little dilemma was a blessing in disguise, however, and led to the creation of one of my new all-time favorite dishes and the star of this blog post: butternut squash lasagna. I trusted my gut, went with flavors I knew would complement each other, and produced something I was truly proud of. 2. 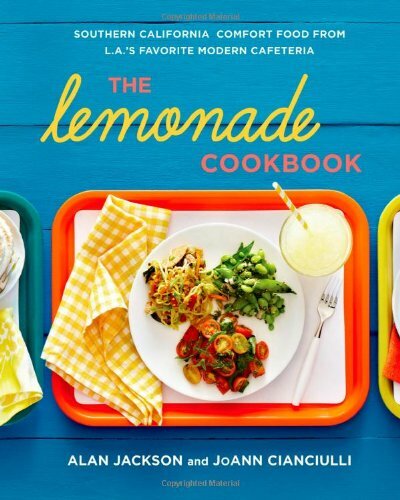 Get a new cookbook. Nothing is more inspiring to me than a brand-spanking new cookbook (the prettier the better). A couple years ago Craig and I were in the Los Angeles airport and stumbled upon a lovely little fast food joint called Lemonade. It…was…amazing. This is one of those local franchises you wish were a national chain, because it’s just that good. They had something like 10 different special salads to choose from, along with braises, sandwiches, and of course several uniquely flavored lemonades and desserts. Everything they serve just screams “fresh.” If you’re ever in the L.A. area, please check them out! In the meantime, you can grab their cookbook and drool over the delectable pictures and mouth-watering recipes. 3. Be nice to yourself. I can’t tell you how much guilt I’ve self-imposed about being in this rut. You can imagine the inner dialogue: “But you switched careers and spent all that money on culinary school!” “People all around the world cook every day…stop being lazy!” Yeah, I’ve been pretty hard on myself. However, I’ve come to the realization that it’s OK to have ups and downs, and if you allow yourself time to experience them fully, it will be easier to carry on. Maybe this phase is just a necessary precursor to discovering the next challenge in my career…and that excites me. So I’ll leave you with the blueprint of the dish that helped me remember what it is like to be authentically creative and to have fun in the kitchen, using flavors like paints on a palette. Enjoy! 2. Line a baking sheet with parchment paper or foil, toss the squash in olive oil, spread out on the baking sheet, and sprinkle with salt and pepper. Bake on 350 F for about 40 minutes or until fork tender. 3. Squeeze out the extra water in the spinach using a clean kitchen towel, set aside. 4. Fry the diced pancetta on medium high heat in a sauté pan until semi-crispy on the outside and slightly golden brown. Drain and set aside. 5. Prepare the béchamel: Melt the butter on medium heat in a sauté pan. Sprinkle the flour over the butter and whisk together. The consistency should be “wet sand at low tide.” Slowly whisk in the heavy cream, a little at a time, working out the lumps as you go. Do the same process with the milk. Once all cream and milk is incorporated, add the nutmeg, chopped fresh sage, and salt and pepper. Simmer over low heat for at least 20 minutes – this is the minimum time you need to cook out the flour taste. The consistency should be just thick enough to coat the back of spoon. Keep warm. 6. When butternut squash is cooked, use a potato masher or fork and mash the squash. A. Spray a glass 9 x 13 baking dish with nonstick spray. B. Spread a thin layer of the béchamel on the bottom of the pan. C. Add a layer of the oven-ready lasagna sheets. D. Spread 1/3 of the ricotta across the lasagna sheets. E. Spread the mashed butternut squash across the ricotta. F. Sprinkle goat cheese pieces over the squash evenly. G. Pour a thin layer of béchamel over the top. H. Lightly sprinkle with mozzarella cheese. I. Add a layer of the oven-ready lasagna sheets. J. Spread 1/3 of the ricotta across the lasagna sheets. K. Spread all of the spinach across the ricotta, evenly. L. Sprinkle the cooked pancetta evenly over the spinach. M. Pour a thin layer of béchamel over the top. N. Lightly sprinkle with mozzarella. P. Pour the rest of the béchamel over the top layer of lasagna sheets, spreading evenly to cover all corners. Q. Sprinkle the top with the rest of the mozzarella cheese. 8. Bake at 350 F for about 45 minutes, with a foil tent to prevent too much browning. 9. Let rest for about 15 minutes, cut into squares, and enjoy! When spreading the ricotta, use a rubber spatula. It makes all the difference in getting an even spread! If you can’t find pancetta at your local grocery store, you can substitute bacon, but ask about the pancetta first. Bacon is in my opinion a little too smoky, salty, and overpowering for this dish, but you may find that you prefer it. If your béchamel is still a little on the thick side, you can whisk in more milk until you get the desired consistency. Just add a little at a time.